We're excited to offer a selection of sale and clearance desktops that are limited in quantity, so you never know what great desk deals you'll find. Our collection of desktops is always changing, so don't wait when you find the desk you like. The Desktop Style Menu lists our most up-to-date product selection. If you have any questions about our sale and clearance desktops, call us at 800-531-3746. The UPLIFT V2 Standing Desk Frame provides almost 26" of quiet, fast height adjustability and can lift up to 355 lb. The UPLIFT V2 Commercial Standing Desk Frame was designed to comply with the ANSI/BIFMA G1-2013 Height Standard (using a 1"-thick desktop). Our patent-pending accessory mounting points enable you to attach a growing line of UPLIFT Desk accessories directly to your frame (pictured on a gray UPLIFT V2 Commercial Standing Desk Frame). This black UPLIFT V2 Laminate Standing Desk features a GREENGUARD-certified laminate top, which is independently tested and certified safe for your home or office. This natural-finish UPLIFT V2 Rubberwood Standing Desk uses solid wood from rubber trees that have reached the end of rubber production—making it both a durable and eco-friendly desktop. 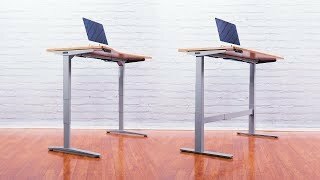 The UPLIFT V2 Bamboo Standing Desk is a superb choice for a height adjustable workspace with a unique look. The carbonized bamboo has a rich horizontal grain, and the material itself is harder than some solid woods. When you select the bamboo curve shape for the UPLIFT V2 Commercial Standing Desk, you're adding even more comfort to your height adjustable workstation. The GREENGUARD-certified walnut laminate top gives you a natural look without the need to cut down an additional tree (featured on the UPLIFT V2 Commercial Standing Desk Frame). UVwhite > Eco Desktop - White 72" x 30"
Looking for an award-winning, height adjustable desk at an unbelievable price? Our sale and clearance desktops are just that. Simply put, these are styles or sizes that we've discontinued—so we aren't making more of them. These desks are brand new and in stock, built with the same great quality you've likely heard about. And they're all available with the UPLIFT V2 Frame, which Wirecutter named their "Best Standing Desk." Choose from eco, GREENGUARD-certified laminate, and rubberwood styles. As availability changes, we'll add or remove sizes and materials, so be sure to check back regularly if you don't see the one for you. Furnishing a corporate office? Order five or more of these desks, and we'll take $75 off the price of each one. You may also be interested in our UPLIFT V2 Commercial Frame, which complies with the ANSI/BIFMA height standard. Click here to learn more about both of our frames. These desktops are only available until we sell out of them. That means you should act fast if you see a desk you love. But we also add new desk sizes and materials over time. Be sure to check the Desktop Style menu at the top of this page for our current availability—or call us at 800-349-3839. Let's review some of the materials you might see featured here. Our eco desktop is made from powder-coated MDF (100% recycled), for a strong desk with a scratch-resistant finish. The GREENGUARD-certified laminates are durable and environmentally friendly. And our rubberwood tops make use of trees that have already seen years of rubber production. Can't find the size or material you need? We offer a large number of in-stock desktops—or check our comprehensive Desktop Brochure for even more options. While your height adjustable desk may come in a size and/or material that's being discontinued, it's still built with contract-grade quality and designed to last for years of comfortable working enjoyment at ergonomic heights. Whether you're sitting or standing, you can rely on your UPLIFT Desk to provide a sturdy, versatile, and reliable workspace where you can accomplish more. Which Frame Should I Choose? The UPLIFT V2 Frame has a height adjustment range of 24.5" - 50.1" (without a desktop). Most of our customers pick this frame, as it's sturdy and reliable and suits their ergonomic needs. It also includes our patent-pending mounting point system. The UPLIFT V2 Commercial Frame can raise and lower between 21.6" - 47.7" (without a desktop). It also uses a stability crossbar, (instead of stability braces) and a thicker leg (instead of an inverted leg). These changes ensure the desk conforms to the ANSI/BIFMA G1-2013 height standard, which many companies choose to comply with—and we still included the mounting points. What really sets the UPLIFT V2 Commercial Frame apart is its lower maximum and minimum and its wider height range. It can support ergonomic working postures for 5th percentile females through 95th percentile males, in both seated and standing positions. We built something into these frames that we're especially proud of. If you look under the desktop, you may wonder what the 48 holes dotting the crossbar are for. These are our patent-pending accessory mounting points, designed to allow you to quickly install UPLIFT Desk accessories without drilling new holes. They also hide the attachment points under your desk, for a clean, simple look. We're developing several accessories for these mounting points, including a power strip, a desk extension, a CPU holder, and a foot hammock—where you can rest your feet after a long day of standing. Speaking of rest, you can attach a full-body hammock (now available) right under your desktop. Whether you need to take a little snooze or just want to change your posture for some reading and research, this desk has literally got you covered. Please note: the hammock is not compatible with the UPLIFT V2 Commercial Frame because it interferes with the stability crossbar. When configuring your desk, we recommend reinvesting some of your savings back into our Advanced Keypad. Here are a few reasons why you'll thank us. When raising and lowering the desk, you could get by with holding down an arrow button—but with the Advanced Keypad, you have four programmable presets. Once you have your desk heights saved, all you need to do is press a button and watch the desk adjust to the perfect level. This keypad also gives you control over the upper and lower height limits of the desk and the sensitivity of the anti-collision feature. You can limit your desktop's range to avoid bumping into objects, and you control how much resistance triggers it to stop moving. We added a child lock, to prevent people from playing elevator with the keypad buttons. We even thought about the display: 10 seconds after you press a button, the LED dims, to minimize distractions. First of all, we want to say a heartfelt thank you to you, our customers, for all the support you've given us—and continue to give us. Using your feedback, we've grown UPLIFT Desk into an industry-leader, helping people and offices create the workspaces they need to reach new heights of comfort, creativity, and productivity. Our continuing commitment is to provide you with a height adjustable desk that lasts for years and meets the highest standards of quality, while keeping our prices low. Because of your support, more people are working better and living healthier than ever. We're honored to be rated #1 by Wired, Lifehacker, and many others. We also take great pride in being named the maker of the "Best Standing Desk" by both Forbes and Wirecutter (UPLIFT V2 Bamboo Standing Desk). Come join the hundreds of thousands of happy UPLIFT Desk customers, including hundreds of Fortune 500 companies. As you're putting your selections together, be sure to consider power and cable routing, because they can have a direct impact on your standing desk experience. You might just plug everything into a standard power strip and call it done; but if you've never worked at a height adjustable desk, you might be in for a little surprise. We recommend choosing one of our power solutions, because they're made for height adjustable desks. Whether you opt for power grommets, clamp-on power modules, or surge protectors with longer cords, you'll help ensure your devices stay plugged in when raising or lowering the desk. In order to raise that level of surety, you also need to address the hanging cables at your workstation, since they can snag as the desk travels. Implement one of our wire management solutions to give your desktop an organized look and minimize any cable pulling. We'll even include a wire management tray with your desk, to help you get started. Considering four or more of these desks for your office? Let us put together a free layout for you. Our design experts help you find the best desk configuration for your space—so you don't have to spend hours on delivery day figuring it out. Just complete these four simple steps, and we'll create a desktop layout design specifically for your office workspace. Can I get any additional discounts on this desk? Yes! If you buy five or more desks, we'll discount each one by $75. What kinds of desks can I expect to find on sale? Our Sale and Clearance UPLIFT V2 Standing Desks are discontinued desktop styles and/or sizes we're not making anymore. That means they have a limited availability—and you might not get another chance to purchase them in the future! With a rotating selection of desks to choose from, it's smart to check back often to see what we have in stock. Do you have any solid wood desks? Is there anything wrong with these desks? Why are they on sale? As the leading standing desk maker on the market for over a decade, we sometimes end up with a few unique desks that we've decided to stop manufacturing. These are brand new, stylish, fully functional desks in need of a good home. We proudly offer these to the public at a significant discount, so people of all budgets can still experience the benefits of a standing desk. I live outside of the US. Will these desks work with my outlets and voltage? Every desk we make is designed to run on the US electricity standard of 120 volts. So, if you order a desk from outside the United States (excluding Canada), you'll will need to plug it into a step down transformer before plugging it into your power source. Skipping this step could overload your desk's control box, which is not covered under warranty. Please reach out to our team via telephone (800-349-3839), email, or chat if you have any questions. Take a peek at the silver label on your control box. If that sticker says v4.1, v4.2, or v4.3, you have the newest version of UPLIFT Desk's control box, which comes with some exciting new features! What features are included in the version 4 control boxes? You'll love our version 4 control boxes because they come with new safety features: keypad lockout and collision sensitivity. The collision sensitivity feature allows users to set the sensitivity for their desks to one of three levels, so when adjusting for height, the desk stops when it touches an object—instead of continuing to move, which can cause accidents. Keypad lockout lets you keep unwanted hands from adjusting your sit-stand desk (when the feature is activated). And users can now switch quickly between one-touch and constant-touch modes, as well as between inches and centimeters on the display. Do UPLIFT Desks still come with a 3-stage frame? Yes! All UPLIFT Desk frames are 3-stage and use three spindles instead of two—which means they can adjust 33% faster than 2-stage frames. These 3-stage frames also have a higher and lower adjustability range, so they fit shorter users, and kids, as well as very tall users—or those who plan on adding a treadmill down the road. How thick are these desktops? Our desktop thicknesses are as follows: eco (0.75"), laminate (1"), and rubberwood (0.81"). If you have questions about which desk would be ideal for you, give us a call at 800-349-3839 and we'll be happy to help you choose yours. What is the lifting capacity for these desks? Our 2-leg UPLIFT V2 Standing Desks have a lifting capacity of 355 lb. The UPLIFT V2 Frame was put through a rigorous 20,000-cycle test with a load of 220 lb. Can I choose a desk I don't see here? If you have a specific desk in mind, but you don't see it here, explore our UPLIFT Height Adjustable Desk page. All of our sale and clearance desks are unique, with some featuring grommet holes and some without. Check our desk builder to see which of our available desks best meets your requirements.